Orange is the New Black season begins June 17 on Netflix. There may be some crazy surprises in store. 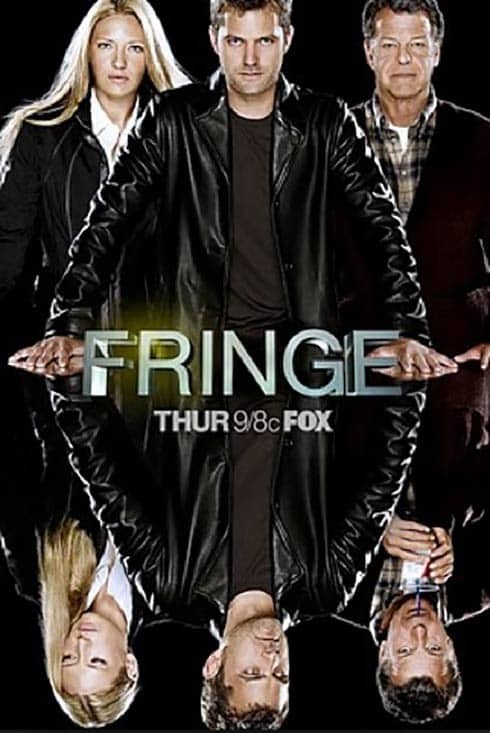 Fringe completed its 5th and final season earlier this year. There were 100 episodes in this Sci Fi drama full of parallel universes, strange beasts, and far out science – or “fringe” science – concepts. When it first came out, back in 2008, I watched a few episodes, but my attention was spotty. It was on at a bad time for me and I couldn’t give it the regular week-by-week attention it requires. I never got into it. Why didn’t I get into it? One of its creators, J.J. Abrams, is known for some pretty popular shows. That didn’t sway me. I originally wanted to watch because of Blair Brown. Blair Brown has been a huge favorite with me since her wonderful performance on The Days and Nights of Molly Dodd . That couldn’t keep me watching. Bottom line, I just didn’t watch it. Five years go by, and Netflix keeps suggesting to me that I would enjoy Fringe . Netflix knows my Sci Fi habits better than I do. It’s that time of year with the summer shows are over and the fall shows haven’t started. What can you do with an empty TV night? Giving Fringe a try sounded like a good plan. No surprise to you Fringe fans out there – I love the show. I’m only in season 2, so I have lots more watching to do, but I’ll share why I love it. If you aren’t already a fan, you might give it a try. This procedural drama is fronted by a woman. Anna Torv plays FBI agent Olivia Dunham. Olivia Dunham is strong, smart, brave, and a great detective. A perfect character to lead the cast. A show led by a woman who is strong and smart? Bingo. I’m now a hopelessly devoted Anna Torv fangirl. Binge watching turns out to be a perfect way to watch Fringe . You need to see every episode in order to make sense of the story. The fringe science builds over time to explain what’s happening, and the idea that there is a parallel universe threatening the one we live in develops episode by episode. Each episode has its own standalone FBI mystery to solve, but the plot points lead you into a larger story about parallel universes and alternate timelines. Lance Reddick as Phillip Broyles, Olivia’s FBI boss. He seems stern and obstructionist, but he generally believes Olivia when she comes to him with a strange story about creatures who can shape shift or have body parts that come from scorpions. John Nobel as Dr. Walter Bishop, a mad scientist who’s been in a mental institution for 17 years but is responsible for most of the fringe science that’s invading the current universe. He’s brought out of the nut house to work with the FBI to figure out the mysterious goings on. Walter doesn’t always remember what he did years ago to create the startling science cases we see now. Part of Walter’s charm comes from the things he goes through to try to jog his memory. In addition to not remembering a lot of his former science experiments, Walter is hiding information deliberately, especially from his son Peter. Blair Brown as Nina Sharp from Massive Dynamic, a biotech company headed by Walter Bishop’s former partner William Bell (Leonard Nimoy). Massive Dynamic may or may not be responsible for much of the chaos the FBI sets out to investigate. Kirk Acevedo is Charlie Francis, Olivia’s FBI partner. Mark Valley is John Scott, another FBI agent. Olivia is in love with him but he’s killed off early in the series. Joshua Jackson is Peter Bishop. He’s Walter’s son. The two have been estranged for years, so there’s a subplot of father son relationships running through each episode. Peter has a rather testy attitude toward his father’s mad science, but nevertheless helps the FBI by keeping his father focused and by being a generally handy fellow to have around. Jasika Nicole is Astrid Farnsworth, an FBI scientist who becomes Walter’s lab assistant. Her part grows slowly. She has little to do early on, but she is used more and more as the series goes on. Based on where I am in season 2, the real story about parallel universes and alternate timelines is just getting going. Season 1 was mostly build up. I’m looking forward to the rest of the story. If this show had been canceled after season 1, it would never have had a chance to tell its real story. There was danger of that, because the show had low numbers, but it hung on. Now it has a developing cult following, including me. I’m still a little amazed that our digital lifestyle allows shows to live on and continue to grow and convert new fans. Fringe had an active Facebook page with about a bazillion photos you might enjoy looking through. Are you already a Fringe fanatic? Please share your reasons for loving the show.